« Jenny Lasimbang can come to Sarawak-but can she perform her work as Suhakam Commissioner? 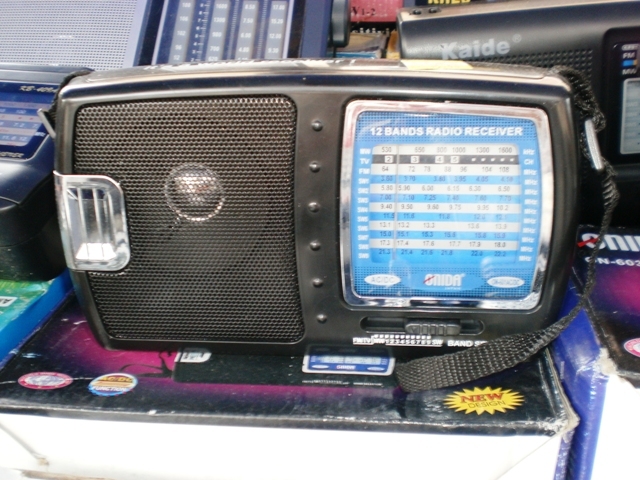 Japanese and China made short waves radios go for Rm35.00 per unit at a itinerant stall in Mukah. Radio sets are prevalent in many parts of Sarawak's interior-which make it a convenient entry point for information. The Radio Free Sarawak(RFW) has been well received by the blogosphere in and out of Sarawak within 3 days of its transmission. Almost all blogs/web sites are helpful to help publicise its birth and report it as a news item. This speaks volume of the repression of news in Sarawak as well as the bigger such repression in the vast interior of Sarawak where it is almost like an information black hole-nothing go in nor out! Yet the interior is where the power lies in Sarawak, and by extension, the entire country. The heavy rural weight-age given to rural areas in terms of seats in state assembly and parliament means that the vast majority of the seats in Sarawak will be decided in the interior. And this was done on purpose because this area has been the ruling party’s `fixed deposit’! The voting trend in this area has been unchanging for the last half a century-where voting become not so much a periodic choice, but a returning `festival’ for the folks to get some goodies from the ruling politicians! And over half of the folks are not even given the right to vote! So there is a job cut out for the radio station as an instrument to educate the interior folks about their voting rights and also to allow them to vent their suppressed sentiments. The only information source for them has been from the government-the radios and TV. Even this cannot be received in all of the interior either due to coverage issue or due to a lack of receiving radios/tv. In many parts of Sarawak there is no electricity supply to start with! Thus RFS does fill in the gap as the much needed alternative and more balanced source of news and views. After tackling the technicality to broadcast a loud and clear message to the interior the next challenge is how to satisfy the much/long suppressed information-hungry audiences: which range from those who want another point of view to balance the ones from the ruling side, and others who want a totally `on-the-other-side’ broadcast which counter-balanced the ones from the ruling parties. It may end up some where in between -but the opening up of choices will certainly prove to be exciting to the interior folks and those outside -but have much interests to keep an eye on this part of the world which they have great difficulties to access but cannot afford to give up entirely! The faster the interior folks are told of this radio’s presence the faster the change may come! Let’s keep our ears and eyes open. Burdening the fellow poor residents of shophouse owners in Kampung Tasik Permai, is not a proper way in governing Selangor. If this trends goes on for another hundred years or thousands years, the fellow subjects of Selangor will be the sufferers, not enjoying what the state government gives. Since year2011 is still the PR/permanent resident government or kerajaan ic merah, who intends to reap a profitable margin from the poor residents of Tasik Permai. We had no trust in them, if now they try to force us to pay a high-cost premium for the shophouses in Tasik Permai, what else for the coming future, will they tax us more heavier for others, say like business licensing, ads board and others. Just a simple thinking what they think of, will we have a granted future? If we are suffering in the future, why must we vote PR for? It’s worst than when BN is in the government, at least regarding whatever it is, we can have a chance to discuss with BN. The 3 stooges they are; PKR greedy power, DAP going too straight, PAS always fighting for an Islamic state, if Islamic state and governs using the Islamic law, other races will be affected. Say a Chinese medical shop cannot sell liquor or betting on 4d or other gaming games will be disallowed. Sometimes Chinese used rice wine which is consider as liquor “minuman keras” which we use as traditional medical uses to rub on the affected part of the human body, say rheumatism sickness. Not drinking actually. I suggest political parties who had the intentions to govern a multi-racial community. If in the 1900 or 1950s there’s not so much nonsense, why must now they create so much rules, will these rules help the “rakyat”. It’s like separating the various races, this “pantang” that “pantang”, so the multi-racial system will be a separated group, you “satu puak” saya “satu puak”. Everyone will be separated, then you have to beware of me, and I have to beware of you. If everyone is scare to mix around, then what is the use of unity among the various races, achieve and work towards the goal till we let the whole world knows what is 1Malaysia, what is the word of working together, staying together with a united front. So, why should we vote and select a government who never cares about the rakyat? Malaysian voters be aware who you choose to represent us. For the future of our next generation, we must be very careful ! ! ! Hidup BN, Hidup BN, Hidup BN !! !